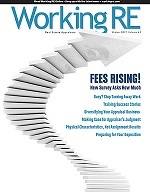 Frustrated with low-ball Appraisal Management Company (AMC) fees, appraisers are digging in, many refusing to work for less, some calling for a national strike to prove their point, but there may be a better way, such as knowing what appraisal services are worth in your market and demanding it. New regulations requiring fair pay for appraisers coupled with verifiable data on median appraisal fees nationwide may make this dream a reality. Knowing what is fair is more than idealism: it has a practical application given the slew of federal and state regulations requiring that fees be customary and reasonable, including new FHA guidelines and new proposed federal legislation, Financial and Mortgage Industry Reform Bill, (find the bill at WorkingRE.com, Sidebar: HR 4173). Many states also have incorporated similar language into legislation to regulate AMCs and in support of appraiser independence. So far, enforcement of “customary and reasonable” has not been clarified nor challenged but it may be soon. To date, appraisers have had a weak hand when negotiating fees with AMCs. Indeed, with too many appraisers chasing too few orders, and with their lender/mortgage broker clients removed from the process by the Home Valuation Code of Conduct (HVCC), appraisers say that jobs flow mostly to the lowest/fastest bidder these days and at fees that are far below what was “typical” for their market less than a year ago before HVCC took effect. Now they have data to prove it. According to Dave Biggers, Chairman and founder of software provider a la mode, his firm has appraisal fee data based on hundreds of thousands of independently contracted URAR assignments from all over the country. The fees are from non-AMC, URAR only, address-validated “real” reports which utilized a la mode’s Mercury Network in the prior 12 months and are updated monthly.